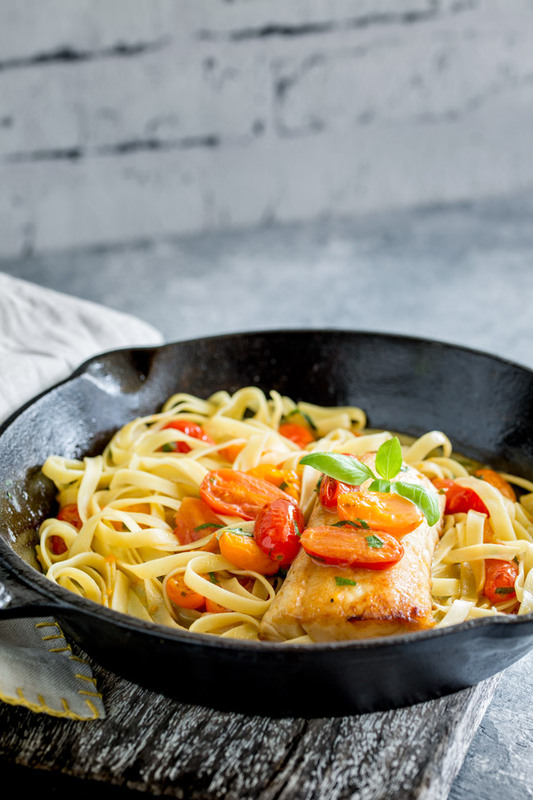 The sauce for this seared cod pasta is simple to make. It is also very quick. You want to cook the tomatoes for only a couple of minutes, otherwise you will find they start to disintegrate and the skins fall off, which makes the dish less enjoyable to eat. 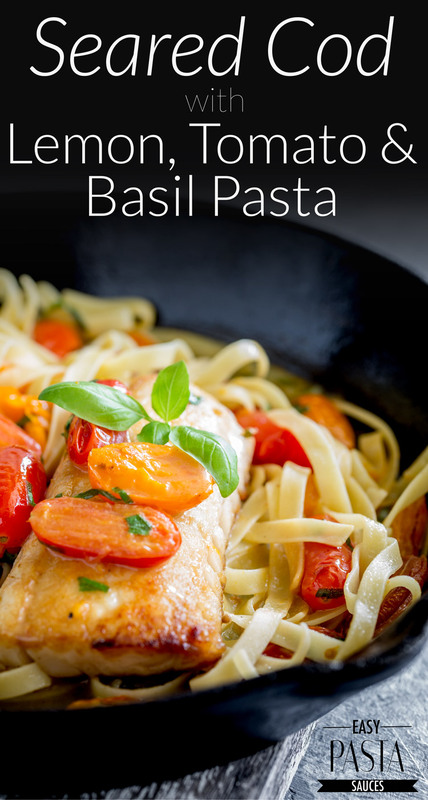 Add the basil at the last minute so that it stays fresh and vibrant. The cod is seasoned with salt and pepper and then seared in olive oil. Don’t over cook the cod, it needs about 8 minutes in total, unless you have a thin tail piece which will take a less time. 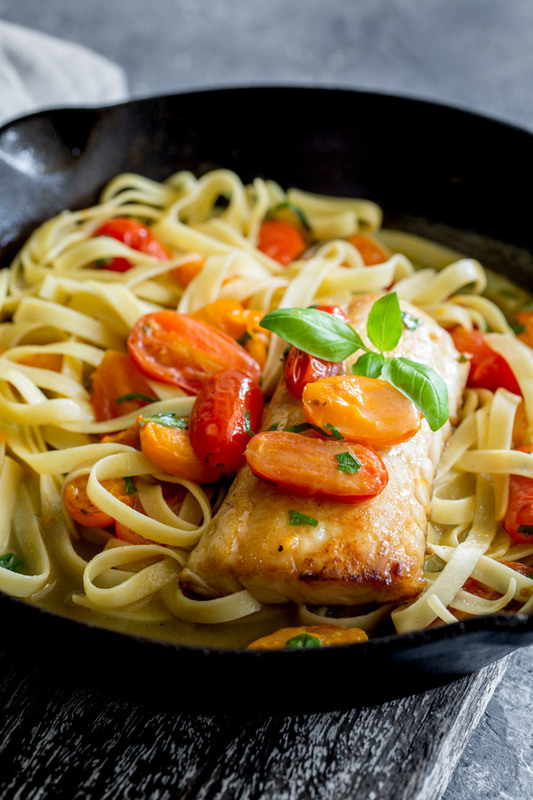 If you can’t get cod then this dish will work with any flaky white fish. Side: The tomato and the lemon in the sauce will work wonderfully with a crisp bright salad. Try a frisse salad which will also work fabulously with the fish. If you don’t mind a little more cooking try tossing some crispy bacon lardons through the salad. You’ll be surprised how well they work with the fish. 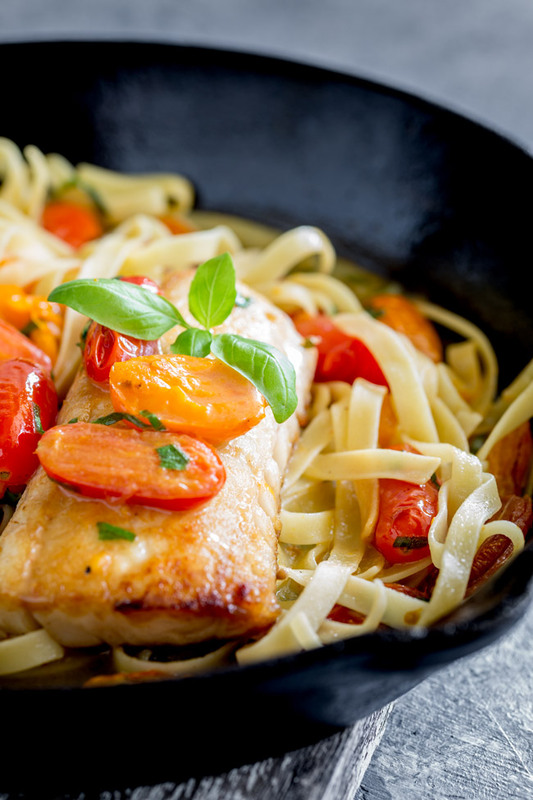 Wine: Tomato and fish together can cause problems when picking a wine. We strongly recommend picking an Italian rosé. 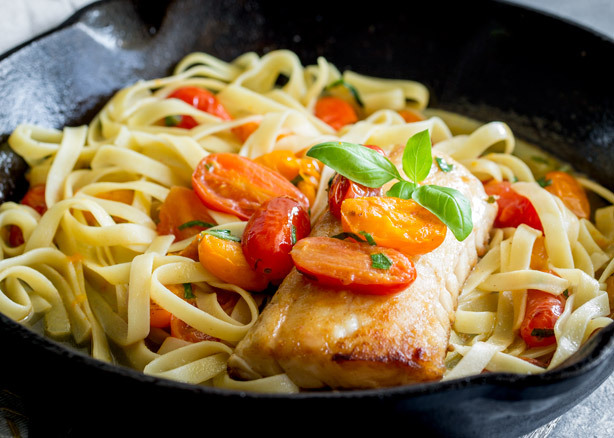 It will balance with the delicate fish but also compliment the tomato and lemon. Or try a Falanghina Greco. For die hard red lovers a lighter Bardolino would be a good choice. 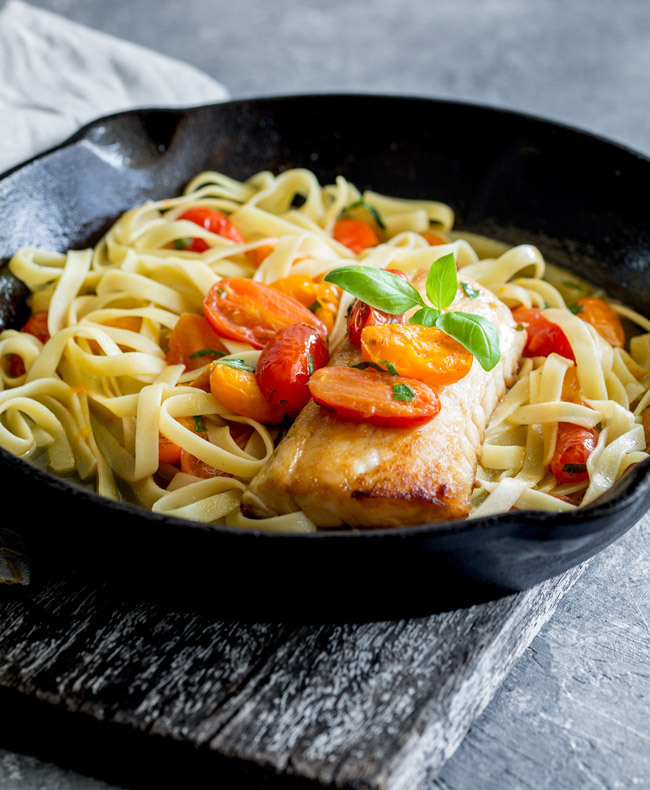 Want to save this Seared Cod with Lemon, Tomato and Basil Pasta for later? Pin it here. Season both sides of cod with salt and pepper then place cod in the oil and cook for 4 minutes on each side. Whilst the cod is cooking bring a large pan of water to the boil. Salt it generously and add in the pasta. Cook for a minute less than the packet instructions. Reserve 1/2 cup of the cooking water before you drain it. Once the cod is cooked remove it from the skillet and lightly tent it with foil. Add the tomatoes halves to the skillet and cook until they have softened slightly. About 1 minute. Add in the stock, brown sugar, crushed garlic, zest of the lemon and 1 tbsp lemon juice. 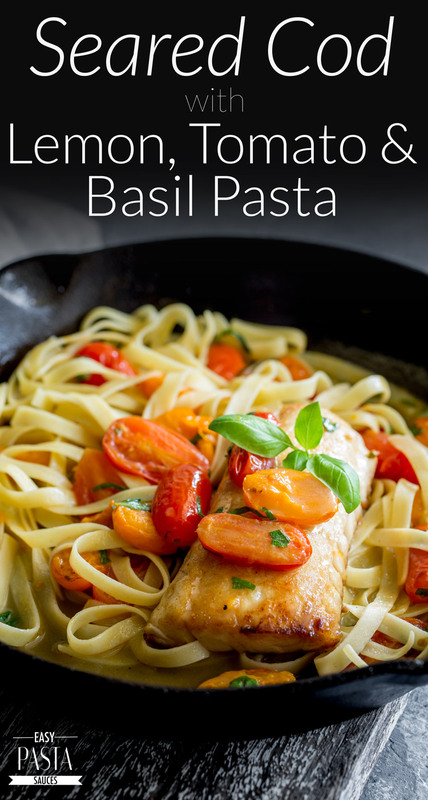 Bring it to a simmer and then add the drained pasta and chopped basil. Stir well to coat the pasta adding 1/4 cup of the reserved cooking water. 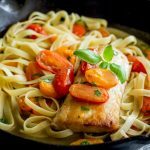 Once the pasta is all cooked Add the cod fillets back in and serve immediately. 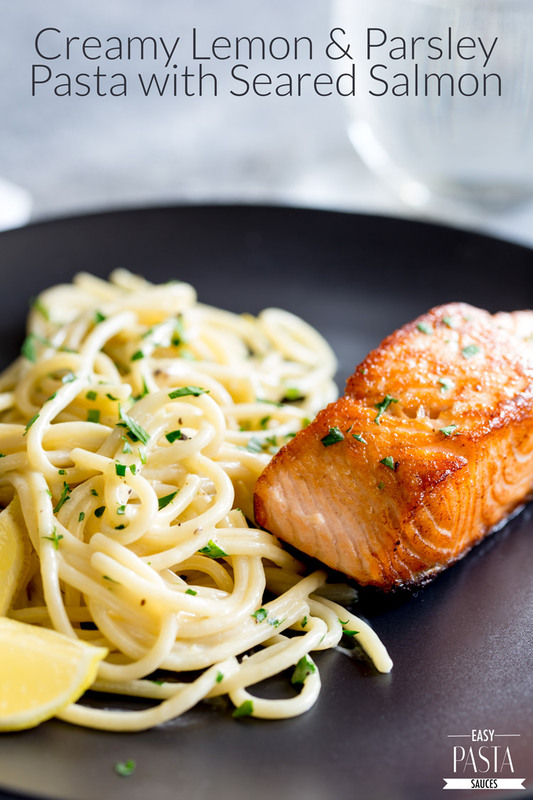 If you love seafood pasta why not try this Pan Seared Salmon With Creamy Lemon Pasta. Ready in 15 minutes it is elegant and delicious!